Mark and Cynthia Lorenzoni met at Michigan State in 1979, and were married in 1980 after moving to Charlottesville, Virginia. 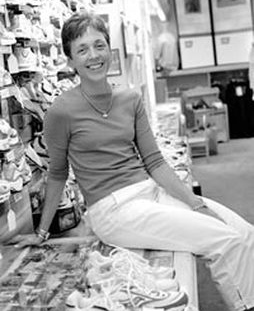 At the time there was no specialty running store in the area, and with their passion for the sport, Mark and Cynthia decided in the winter of 1982 to open shop on the tree lined, brick sidewalked street of Elliewood Avenue across from the University of Virginia. Over the next 14 years, their business and family grew (they now have four children), and in the spring of 1999 they moved to a larger location on Elliewood. In the fall of 2006, thanks to continued growth and community support, Ragged Mountain moved once more to its current downstairs location at #3 Elliewood (former home of Eljo's Traditional Clothiers). Despite the steady physical growth, the Lorenzonis and staff have remained committed to providing their customers with the most courteous, professional and intimate service. They continue to adhere to their original mission of treating each and every Ragged Mountain guest with first class care. A special thanks to our friends, Anwar and Laura Allen (Humbledown Productions), for creating this special family video. Mark has been running since the spring of 1973, when he ran the 400 meters as a Senior for his high school track team in New Jersey. He was a recreational runner throughout college but after graduating, thanks to Cynthia’s encouragement, competed on the roads and is most proud of his 36:15 time on the legendary Batesville 10K course and his 59:42 at the Virginia Ten Miler. In 1981, he began his amateur coaching career writing programs for Cynthia. Since then he has coached thousands of runners (recreational, novice and elite) to their personal goals. Mark runs twenty miles a week and rarely competes anymore, but when he does, he struggles to break 8 minute/mile pace, a far cry from his p.r.‘s from the early eighties but good enough for an “old man”! Besides working at the shop, he now enjoys serving his community neighbors, on a volunteer basis, as a coach, a race director and a public servant. Cynthia has been consistently running (except for time off during her four pregnancies and a bout with plantar fasciitis) since 1972. She grew up in Farmington, Connecticut where she went undefeated in cross country and track during her four years of high school. She was the National High School Record holder for the two mile in 1976 (11:03) and went on to compete for Michigan State University as a scholarship athlete and team captain in cross country and track. She continued to compete after college on the roads, where from 1980-1984 she registered a 2:38 personal best in the marathon, 34:40 for 10K and a 56:50 for ten miles. She won the women's division of the Marine Corps Marathon twice and was honored to be on the starting line of the first ever Olympic Marathon Trials in 1984. Since then, Cynthia hasn’t competed on the national level although she recently resurrected her marathon career, running the Boston Marathon in 2009 and 2010. She also enjoys working on community events and counts her decade long commitment to directing the Women’s Four Miler, which has raised over two million dollars for UVa's Breast Care Center, as one of her favorite causes. Two of the Lorenzoni's four children work alongside Mom and Dad at the shop with both Alec and Audrey serving as co-managers. We currently have 60 part-time employees at Ragged Mountain. All of them run on a regular basis and most are between the ages of 16 and 23. Some are competitive runners for high school or college squads, but most are recreational runners, who run just for fun and get out 3-4 times/week for 30-45 minutes at a time. A few are members of the Ragged Mountain Racing team, Virginia’s first ever post-collegiate Olympic development team. Our staff thoroughly enjoy working with people. We take about four months to train each employee on how to analyze gaits, evaluate running injuries and correctly recommend and fit shoes and inserts based on that information. We are blessed that they stay with our “family” for an average of three to five years. One of the things we are most proud of about our employees is how involved they are with their community. Many of our high schoolers are active with civic and church groups and our college students belong to a variety of service organizations and causes. All of them freely volunteer their time to help those in need.